Austria’s gold and silversmiths are celebrating a special anniversary: the first Crafts and Trade Code for goldsmiths was drawn up in 1366, thereby creating the first gold and silversmiths’ guild. The Guild Act followed one year later. 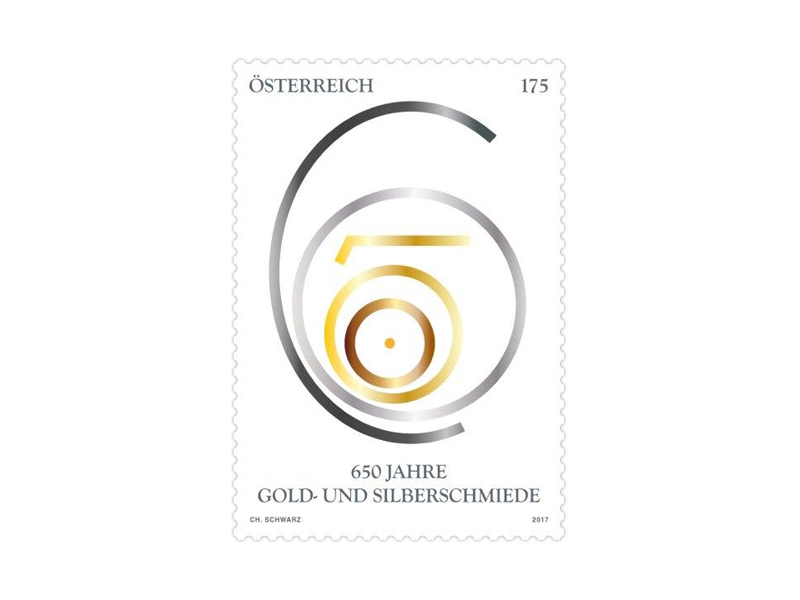 Austrian Post is celebrating 650 years of dazzling history with an elaborately designed commemorative stamp. Prior to this, gold and silversmiths were usually to be found in monasteries, where they produced dazzling artistic works for the church and the court. Only gradually did craftsmen begin to settle in the towns, creating a need for organisation of the various trades. In the towns craftsmen working in the same trade came together to form guilds and fraternities. The Goldsmiths Guild was legally recognised through the Crafts and Trade Code by the sovereigns Albrecht III and Leopold III von Hapsburg on 13th October 1366. The two Hapsburg dukes were the brothers of Duke Rudolf IV, the founder of the University of Vienna, also known as “the Founder”. Thanks to their artistic works and the precious materials they used, goldsmiths were held in particularly high esteem. In 1367 the master goldsmiths and the fraternities introduced regulation of the internal organisation through the Guild Act. The guild became a closed organisation with membership hereditary and entry into it only possible through marriage. Over time the guild’s by-laws were repeatedly amended and adjusted. In 1859 the Trade Ordinance divided trade up into unregulated trades, unregulated trades requiring registration and the licensed trades for which proof of competence is required. The goldsmith’s trade is one of the latter. Nowadays we call it a regulated profession: in order to practise this profession proof of competence must be provided in the form of an apprenticeship certificate and master craftsman diploma. Throughout the centuries gold and silversmiths created valuable works of art for the church, the nobility and the bourgeoisie. Sacred religious items such as chalices, reliquaries, crosses and monstrances contrast with secular works of art such as jewellery, household items or the insignia of rulership. Gleaming gold and silver jewellery still has a special value today. Nowadays traditional Austrian crafts fuse with modern demands: artistic design, innovative techniques and valuable materials combined with the impressive skills of the smiths give rise to individual works of art of lasting value, which also enjoy international renown. 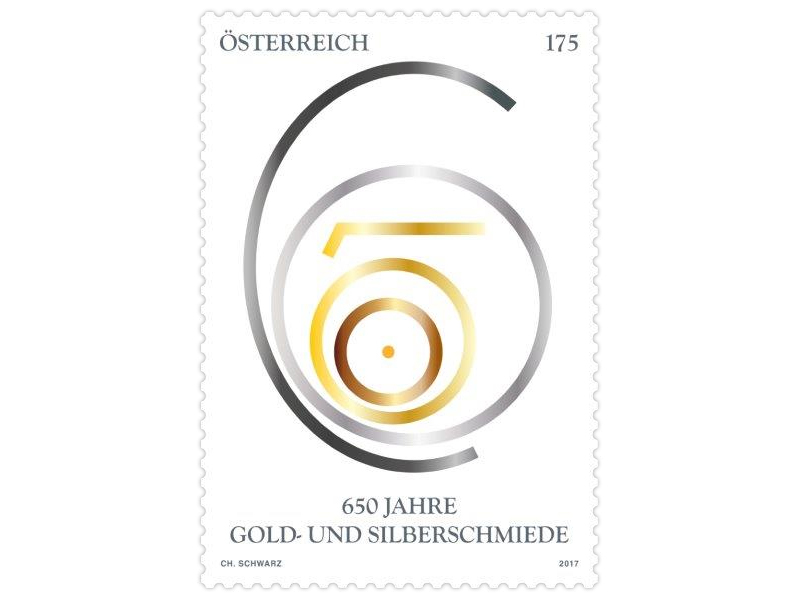 The design on the stamp shows the anniversary logo: a stylised number 650 in a gleaming metal foil. The golden circle and the dot in the middle symbolise the gold and the sun, and thus also the heat that is essential for working with gold. The silver coloured semicircle represents the crescent moon and the silver. It is an exceptional design that does justice to this exclusive trade.